GUELPH — It’s not going to be easy, but it will be world-changing. Artist and activist Kim Crosby was unequivocal in her rally cry to about 200 girls gathered at the University of Guelph for Thursday’s International Day of the Girl event. If they commit themselves to making a difference in the lives of other girls and women locally and around the world, said the Youthline Award winning activist, the girls should know upfront that it’s going to be tough, but worth it. The power is in their hands. “If you don’t prepare young people adequately enough about how hard it’s going to be, no one should be surprised when they give up so easily,” said Crosby, 28, in an interview. She spoke to the large gathering of mostly Grade 10 and 11 high school students at an event marking the first annual Day of the Girl. The global statistics point to the glaring inequality that females everywhere live under, Crosby said in her presentation. Females perform 66 per cent of the world’s work, receive a meagre 11 per cent of the world’s income and own just one per cent of the world’s land. The statistics are sourced from major Amnesty International and United Nations studies. Crosby said every human being is extraordinary, each one performs small miracles and all contribute to the commonwealth. She urged the girls to see the extraordinary in everyone, and to work now to ensure future generations enjoy a fuller measure of freedom. 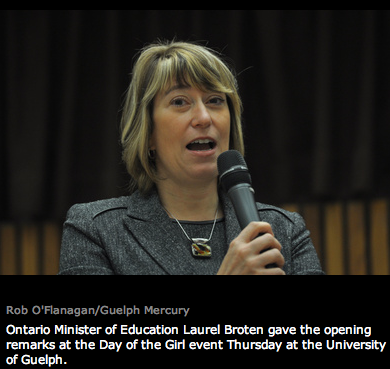 A notable participant in Thursday’s event at the U of G was Laurel Broten, Ontario’s Minster of Education. 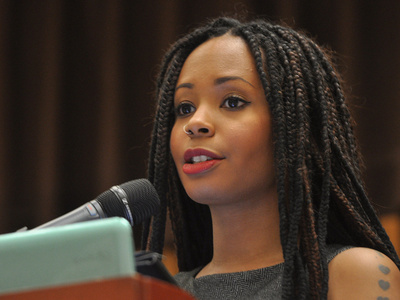 She gave opening remarks and participated in a series of workshops. Broten said young people today have access to telecommunications technology that wasn’t available when she was younger. “You can advocate for and motivate someone around the world,” she said, urging the girls in the crowd to redouble their efforts to empower and support girls everywhere. Maureen Mancuso, U of G provost and vice-president, academic, said there are about 130 million children around the world who have no access to education, and for whom elementary school is only a faint dream. Seven out of 10 of them are girls. “We live in a country of plenty,” she said, adding that social, technological and political changes in this country have given girls opportunities unimagined by women of the past. Emily Perrault, a special projects manager with U of G’s Better Planet Project, was an organizer of the event. Its purpose, she said, was to give girls a forum in which to share the circumstances of their lives, while helping them become more conscious of the condition of girls around the world. Opportunities to engage in actions aimed at improving the lives of girls were provided at the event, Perrault added. A number of community partners were on hand to offer tangible opportunities to get involved and work for change. A strong feminist movement is crucial for enhancing the freedom and equality of women and girls everywhere, she indicated. She urged the girls — who have been bombarded throughout their lives with information about men and masculinity — to learn about girls, women and femininity, and to explore the diverse ways in which the feminine manifests itself. No one can impose a standard over another person, she said. The mobilization of feminist movements, she said, citing a recent study published in the American Political Science Review, is more important for change than the wealth of nations, left-wing political parties or the number of women politicians. “What these findings tell us is that the single most powerful resource in transforming the state and the safety of women and girls, are the women and girls in their own cities, villages, countries,” she said. When women, backed by “the authority that only they can have from having their specific life experiences,” get angry, get organized, and start speaking out, they transformed the world. “I won’t promise you it will be easy, but I can promise you that we can do this, we have everything that we need,” she concluded in her address. Here is a link to the presentation that accompanied this speech.